Published in 1902, Heart of darkness still speaks to our souls: it takes up deep with ourselves. It depicts our irrational fears of Unknown. Inspired by the dreadful racial repressions orchestrated in the Congo by the end of the 19th century, Heart of Darkness has always been considered to be a classic and poweful condemnation of evils of imperialism. Conrad's first-person narrator encounters the dying Kurtz, an immensely gifted man, but also the insane perpetrator of terrible violence. African writers and critics such as Chinua Achebe have pointed out that the story can be read as an allegory in which Africa is a metaphor for what Europeans most fear within themselves, their own savagery. The people of Africa remain unfamiliar, alien, and a symbol of that ungraspable "Otherness". 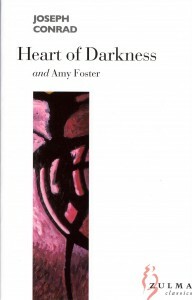 Heart of Darkness is here presented along with Amy Foster; both texts illustrate the fear of the "Other". Both are beautiful appeals to tolerance.